If you want a pico projector that can display bright and colorful presentations all by itself, Optoma's PK102 may be what you need. 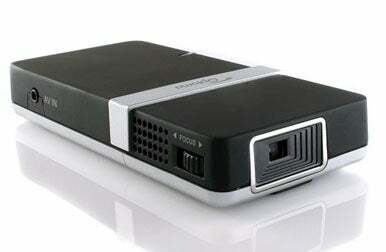 Weighing 4.4 ounces, the 0.6-by-2.0-by-4.1-inch PK102 is the smallest pico projector we've recently tested. Despite being roughly the size of a deck of cards, however, this model packs enough power for solo business presentations for small audiences under low light conditions. The PK102 has a brightness rating of 11 lumens (8 lumens in economy mode); delivers 20,000 hours of LED light; and has 4GB of internal memory for storing presentations, movies, video clips, and digital images. It uses Texas Instruments' DLP (Digital Light Processing) projection technology, and comes bundled with VGA, USB, and composite (RCA-type) A/V cables for connecting it to any device that has video signal output. To use the PK102 with an iPod or an iPhone, however, you'll need a third-party cable (not included). Or you can leave the cables behind, and use the PK102's built-in media player to project your presentations, photos, and videos. Depending on the brightness mode you select, its battery capacity is 60 to 90 minutes. In low ambient daylight at a distance of 4 feet from the screen, the PK102 displayed viewable 30-inch-diagonal images at its native 480 by 320 resolution. In a darkened room at night, it successfully displayed a 46-inch-diagonal image at a distance of 6 feet from the screen. Larger screen sizes were possible but had feebler levels of brightness. In our performance tests, the PK102 displayed vivid colors and earned a rating of Very Good for overall image quality. In displaying text images, the PK102 rendered legible text in large sans serif fonts (in PowerPoint presentation slides, for instance); but smaller text used on slides and Web pages was hard to read. In our graphics tests, the PK102 displayed brilliant colors in several images, but in a few cases, objects appeared oversaturated, with grass that was overly green or skin tones that were too rosy. The projector displayed smooth action in our motion tests, and its well-saturated color was often a plus--especially in a screening of the animated Monsters vs. Aliens DVD. Test videos on an iPhone 3GS and a fifth-generation iPod nano looked good, too, but the PK102's sound (from a 0.5-watt monaural speaker) was rather weak; we would recommend headphones or separate speakers for better audio. The PK102's controls consist of a focus dial and a menu button for adjusting the volume and for using the on-screen display to select photos, videos, or settings. The unit comes with ArcSoft Media Converter 3 software for the PC, a drag-and-drop app for converting PowerPoint and other media files to formats that the PK102 supports, and then automatically importing them into the projector's built-in memory via the bundled USB cable. Missing from the PK102 package is a mini-tripod, though the projector does have a tripod screw hole, in case you want to add a tripod yourself. Colorful display capabilities and a built-in media player enhance the allure of Optoma's PK102, a tiny projector that's as easy to carry around as a mobile phone.